← Financial terrorism by bankers put Greece in the noose. Who is next? Plunder beyond belief, FED reluctantly shows the smoking gun. I have for decades been trying to explain the parasitic nature of the global financial regime and the political order that has become subservient to it. Now, the evidence has become so overwhelmingly obvious that even the most dubious and somnambulistic amongst us cannot ignore its meaning. On December 5 I posted an item that included Senator Bernie Sanders’ courageous speech about the class war that is being waged against virtually everyone by the super-wealthy elite. In that speech, the Senator referenced the long awaited report from the FED that Congress has demanded. This report has started a firestorm involving even the mainstream financial media. In this recent article, David DeGraw, lays it all out in detail (Wall Street’s Pentagon Papers: Biggest Financial Scam in World History) with numbers and quotes from various sources. Please read it. Now it is up to us to do something about it. What can be done? 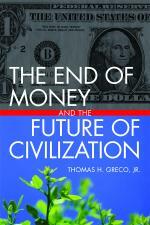 My book, The End of Money and the Future of Civilization, lays out prescriptions for communities, grassroots organizations, businesses, and governments. The time to act is now! This entry was posted in Finance and Economics, Prescriptions, The Debt Imperative, The Political Money System. Bookmark the permalink. Finished reading your book. Thanks. I worry, however, that gaining control of credit is not a sufficient solution. The wealthy, through governments, have a long history of undermining any structure that they see as reducing their profit. Just because credit clearing is currently allowed does not mean that it can’t be stopped by those who oppose it. So, while I agree that control of credit is the most important economic solution, it cannot stand alone and it will not be allowed to. — So that we can have a sane, valid legal tender. — I realize that this may be impossible here in the United States. 2) Create a currency tied to non-consumables, that is consumed by consumables. “….and political order that has become subservient to it”. do what they do under what is effectively a licence granted to them by the State in the shape of legal tender laws. the current state of affairs simply could not have arisen. The fact of the matter is that the entire political / economic edifice is rotten to the core. Unfortunately, beyond a tiny minority of folk I see little evidence that this is widely recognised and thus the likelihood of any meaningful change remains at best remote. To me, this is best illustrated in the monetary field by the fact that nearly all the reform groups I have come across seek a ‘sovereign’ money solution – a truly incredible notion given the historically abysmal record of State issued money. Complete separation of money and State, as you believe, is indeed the road to go down, but very, very few are even prepared to countenance the idea let alone implement it. Whatever, really appreciate your work. Yes, of course you are right. I made a poor choice of words. The politicians are in collusion with the financial elite, as I say in my book. They together constitute the global oligarchy. The system cannot be reformed, it must be transcended and replaced.